We caught up with Agnieszka Bielecka who gave us the scoop on her native city. From historic museums, to where the food and party scene resides, this hip guide to Warsaw tells all. The Palace of Culture and Science, an imposing tower standing right in the heart of the city, was a “gift to Poles from the Soviet nation” back in the 1950s. Because of its origin, it still evokes a range of ambivalent opinions among local residents, but, like it or not, the Palace became a symbol of Warsaw. You could easily explore it for days, but start with a visit to the observation deck on the 30th floor, which offers a great panoramic view of the city. The interiors of the Palace hide several theatres, museums and an elegant concert venue Sala Kongresowa, you can also have lunch or a late night drink at one of two great café-bars there: Café Kulturalna and barStudio. While the Warsaw food scene is thriving and new eateries open daily, many say that the Polish soul can be found in so-called milk bars. They are relics of communism, when comrades of all social classes were entitled to a cheap decent meal during their lunch break. The Berlin Wall is long gone, but milk bars stayed and seem to prosper, relatively unchanged. You’ll find the daily menu extremely cheap and composed of traditional everyday Polish dishes: pierogi (dumplings with various fillings), cabbage stews, pancakes, pork chops and fried beets, all made on-site by middle-aged ladies in hairnets, yelling from the kitchens when the dish is ready. Milk bar regulars love the cheap hearty food and a social mix of students, businessmen, hipsters and homeless people. As long as you don’t take anyone’s portion of pierogi, you’ll be more than welcome. 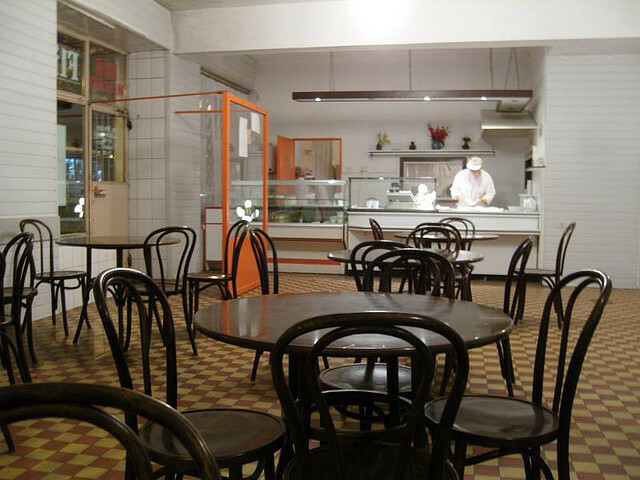 Some of the best milk bars include Rusałka (Floriańska 14), Familijny (Nowy Świat 39), and recently renovated Prasowy (Marszałkowska 10/16). Warsaw is quite large and rather chaotic, and using public transportation might be a little challenging for a newcomer. As there’s only one metro line, I recommend staying on the ground, and riding electrical trams instead. Trams have been circulating around Warsaw’s streets for over a century now, and they will take you to most of the districts, avoiding traffic jams and speeding happily across the bridges over Vistula. Some of the trams are quite old and riding them will be an adventure, but it’s always a great way to explore the city. I’m a local resident and so I’ve never stayed in a hotel in Warsaw, but I did hear exciting stories about Oki Doki (Plac Jana Henryka Dąbrowskiego 3), an art hostel around the corner from the Palace of Culture. Oki Doki has 30 rooms, each of them designed by a different artist, what results in a festival of creativity, colours and styles. For a good night’s rest, you can choose from Chiapas dorm, Danish Room, or – whatever it really means – The House of Maiden. As a vegetarian, I’m always searching for new meat-free options around the city, and there are more and more places offering top-notch veggie cuisine. Krowarzywa (Hoża 42) was recently voted the best burger place in Warsaw, even if their menu is entirely vegan, with burgers made of chickpeas, buckwheat, tofu and vegetables. I tried all of them, and never felt disappointed, and I assume neither did hundreds of others, as Krowarzywa is bustling until late into the night. All around the city, there are stores called Cepelia, selling Polish folk art and handicrafts. There’s a big one on Marszałkowska street 99/101, where you can buy beautiful blue and white pottery from Bolesławiec, wooden figurines and colourful fabrics. For a little different experience, head to a store called Reset in Mokotów district (Puławska 48), that sells products of young Polish designers, and vintage Polish furniture. Warsaw has the reputation of being a grey, chaotic city, and it may take a visitor a few moments to realise it’s actually full of greenery. My favourite is Park Skaryszewski, located just across the street from the National Stadium. It’s large and rather wild, and apart from the usual kinds of entertainment (squirrels, clearings that are perfect for picnics, and a rose garden), it will provide you with plenty of entertainment. Tucked in one corner of the park, Misianka, an old public toilet turned into a café, serves the best ‘Armenian tart’ in Warsaw. 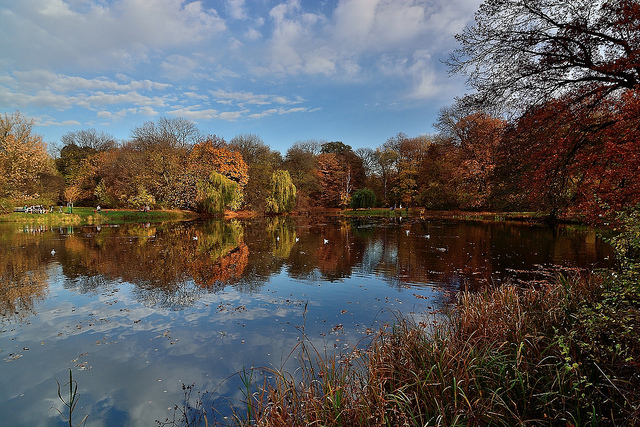 For water enthusiasts, there’s a little pond Jeziorko Kamionkowskie, where you can rent boats and kayaks, and then meander through peaceful waters, trying not to hurt any ducks. With favourable winds, a faint smell of chocolate will drift towards you from a nearby Wedel chocolate factory. It’s hardly for a joyful occasion, but one of my favourite moments to be in Warsaw happens once a year, and lasts for exactly 60 seconds. The first of August is the anniversary of the beginning of the Warsaw uprising, a 63 day-long resistance battle that occured at the end of the Second World War. At 5 PM, when the fights broke out, sirens all around the city start wailing and the entire city stops. In a blink of an eye, all traffic freezes, trams start ringing their bells, pedestrians stand straight. After 60 seconds, the sirens’ wailing fades, and everything gets back to normal in no time. To learn more about the wartime and resistance fights in Warsaw, I recommend the Warsaw Rising Museum, an immensely popular, interactive spot that will keep you emotional long after the visit. Searching for the best coffee in town is a never-ending quest, as there are dozens of lovely cafés that pride themselves on a perfect roast. I avoid chains, and head to smaller local spots, scattered around Warsaw. Among my favourite are Filtry (Niemcewicza 3), Relaks (Puławska 48), My’o’My (Górskiego 8), and Pewnego Razu (Dzielna 15). Summer may be short in Poland, but locals know well how to enjoy it. For hot sunny months, all Warsaw seems to move to the riverside, and that’s where you’ll find me every weekend. The Vistula river isn’t good for swimming, but the holiday vibe is present on several beaches. A sandy patch near Poniatowski bridge has deck chairs and beach volleyball courts. At night time, parties last for hours in Plażowa, making the beach a place to be 24/7. On the left side of the river, several open air venues offer relaxing times at daytime, and in later hours fill with party goers of all ages. Walk along the water around Płyta Desantu, and choose your favourite. The Centre of Contemporary Art in Ujazdowski Park is an important venue promoting modern art, with an impressive event calendar, a little cinema, very well stocked bookstore and amazing views. Around the corner, there’s the Theatre Institute, where you can join a debate, watch a spectacle or browse through the library. Basen, a concert venue located in an old YMCA swimming pool, hosts great shows in an interesting setting (Konopnickiej 6). So does already mentioned Café Kulturalna in the Palace of Culture. Holy Saviour Square, a lovely piazza surrounded by honey-coloured arcades is the place to be. Plan B, a laid back bar and concert venue kicked off the trend, but it was its neighbour Charlotte that started the real craze. The bistro serves wine and French specialties, and buzzes with life until the wee hours of the morning. If all the tables are taken, wander around the square, explore some of the numerous bars, and admire a rainbow, an art installation by Julita Wójcik, located in the middle. Pawilony, hidden in the courtyards of the elegant avenue of Nowy Świat, are a bustling maze of shady bars that are immensely popular among students and youngsters. Start the day in a delicious way, and head for breakfast to Bułkę przez Bibułkę (Zgoda 3) right in the city centre. After your morning coffee, while walking towards the Palace of Culture, make a quick stop to watch old photographs at Fotoplastykon (Aleje Jerozolimskie 51), an ancient wooden cylinder that’s a slide-operating device. It’s hidden in one of the pre-war courtyards, and has been in use for more than a century. After that, climb up to the observation deck of the Palace of Culture, to admire the panorama of the city. When you’re done with the vistas, take a tram to Nowy Świat. Have a look at a lonely palm tree standing on the Charles de Gaulle roundabout. It’s an art project of Zuzanna Rajkowska, and was meant to remain there only for a few years, but we liked it so much it stayed in Warsaw for good. 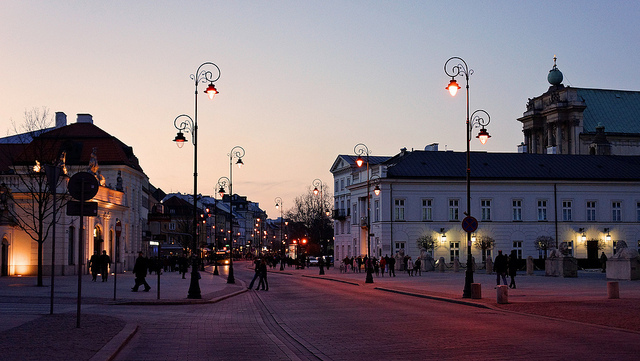 Wander down Nowy Świat towards Krakowskie Przedmieście, a representational avenue that ends in the Old Town, passing the main campus of the university and the Presidential Palace. The buildings of the historic district were painstakingly restored after the war, and even if the Royal Castle is in fact merely 40 years old, you won’t be disappointed after a stroll through the cobbled streets lined with colourful, narrow houses. 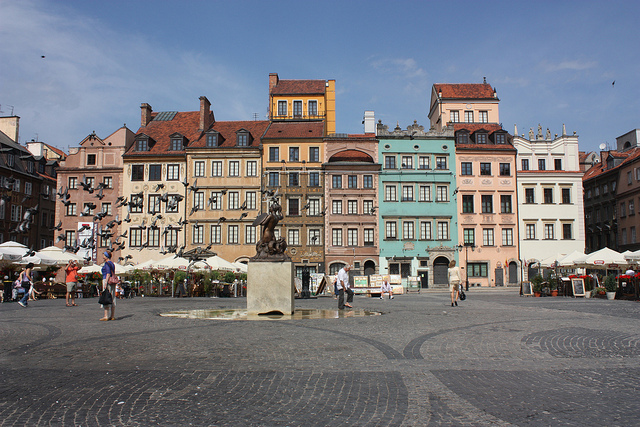 While on the Old Town Square, look for a statue of the mermaid, the symbol of Warsaw. Walk down towards the river through the area called Mariensztat, which looks like a mini-Trastevere, with pale red facades covered with vine, and sleepy squares with whispering fountains. Soon, you’ll reach one of the nicest contemporary buildings in Warsaw: the University Library. It has a great rooftop garden open to everyone, where you can picnic, relax and admire the views over the river. Grab some lunch in SAM (Lipowa 7a), and head back to the centre. To explore some history of the 20th century, visit the Warsaw Rising Museum, or the new Museum of the History of Polish Jews, which stands in the heart of what used to be a Jewish district and then a wartime ghetto. For a moment of relaxation amongst greenery, visit Łazienki (the Royal Baths), a splendid, elegant park within the monument of Chopin. If you’re here on a weekend, try to come for a free open air concert of classical music, organised regularly over the summer. If you’re in the mood for art, visit the nearby Centre of Contemporary Art, or head straight for dinner at Atelier Amaro (Agrykola 1), the only Polish restaurant awarded with a Michelin star. If you’re a bit lower on cash, return to the centre, and choose from numerous options around Hoża, Poznańska and Wilcza streets. My favourites there are Tel Aviv (Poznańska 11), Beirut (Poznańska 12), a vegan bar W Gruncie Rzeczy (Hoża 62) and Mandala (Emilii Plater 9/11). After dinner, head to the Holy Saviour Square (Plac Zbawiciela) for a glass of wine in Charlotte or a crazy dance in Plan B, and enjoy Warsaw. Agnieszka Bielecka is a writer and translator born and raised in Poland. She spent several years travelling and living abroad, and is still looking for the best place to call home. She is the author of a blog Where is Somewhere Else?, where she documents her travels, inspirations, books and food.